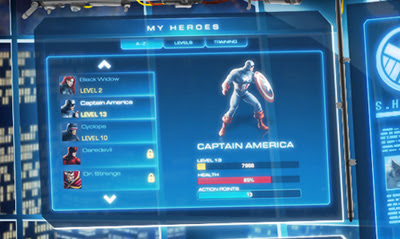 As if Facebook didn't soak up enough of your free time, soon in 2012, you'll be able to create your own team of Earth's Mightiest and pit them against the likes of Loki and Mystique in Marvel: Avengers Alliance, the first Marvel or Disney title to launch for the Facebook platform. However, like Scarlet Witch, Iron Man, Wonder Man and more have proven in the past, sometimes the team's biggest opponents come from within their own ranks. In keeping with that tradition, you'll also be able to pit your crew against that of your friends. I mean who wants to 'poke' when you can 'repolsor ray' or 'hurl Mjolnir'? Playing a S.H.I.E.L.D agent who has to assemble a team of heroes after a galaxy wide disaster known as "The Pulse" sets the villains of Earth on overdrive, you will have dozens of goodies to select from, with promo art suggesting Ms. Marvel, Hawkeye, Daredevil, Dr Strange, Hulk and Captain America among the candidates! Already salivating over who will lead your line-up? Wondering if the whimsical Beast will land a spot or Giant Man? Then keep your eyes peeled. Disney Interactive Media Group's Marvel: Avengers Alliance will be on Facebook in the first quarter - and that doesnt leave long! Dan you are on top of all the news. I love it and the face book idea. Believe it or not I don't even have a face book page. I'm I out of touch with the times////don't answer that. who's in your line up? Not bad Marvel/Disney, and very well-played since the movie's coing out in all. If I had a FB account, I'd be playing this one too! I've got a FB account and waste plenty of time on that black hole of personal time. Send me a friend request Dan. I saw the add for this game yesterday and I'll definitely be playing this. Craig, will do mr. Consider yourself Avengers Academy, because my Avengers West will be taking ya to school! Dale, I think its a stroke of genius myself. A free game on the worlds largest social media site? Thats almost as much exposure as the movie! Eat that Farmville! 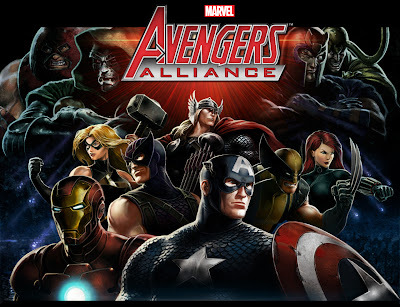 OA, with no set candidate list yet and even Cyclops in the teaser art its hard to think whose not available or how many I can pick. Still the first 5 coming to mind are my boy The Thing, Daredevil, War Machine, Beast and Vision. Who would be yours? heck if we all got pages we could have an IADW squareoff! T'Challa, Storm, Namor, Valkarie and Blade. Facebook Fight Club. I want a video game for X Box. Now that's a line up that needs a book built around them OA -wicked choices! If mohawk Storm was in even better. Craig if villans are aloud to join that would be awesome. Venom would be added to mine in a heartbeat. Eddie Brock version only though, no one else feels right. Hey Treysome - welcome to IADW! That's a pretty fierce line-up you've assembled right there, Kitty has long been missing from Marvel vs video games, so like you I'm hoping she gets a decent run here!